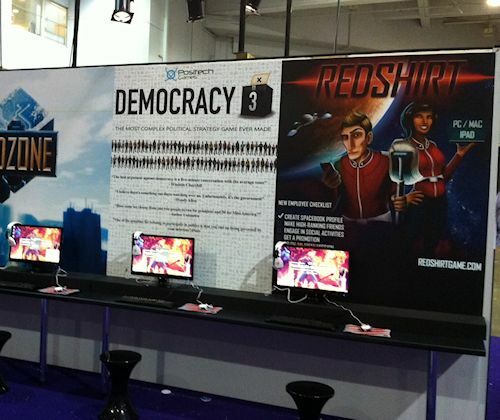 Anyway, here’s hoping this proves worthwhile and lots of people enjoy trying out Democracy 3 and Redshirt. We have badges and fliers that we are literally giving away, starting tomorrow, for four days. I will have lost my voice and be unable to stand by Sunday, I’m sure. Do those monitors look small to you? they do to me. I am itching for an excuse to replace both my home monitors with big silly ones. If I hypothetically did a Gratuitous Space Battles sequel, I’d definitely plan on showing it off with big ridiculous 40 inch monitors if I ever did any shows to promote it. I know there are some of you people out there that amazingly do not live in the UK and will not be able to come try out the games, so my honest, considered opinion is that you should just PRE-ORDER THEM NOW, and then you can play them immediately at home without having to pay £10 for a sandwich in central London. The system is pretty similar in a technical sense to Democracy 2’s modding, although there are some new features, and the whole system is much better at coping with multiple mods. if people stick to the ‘system;’ then mods will all be installed in completely discrete folders and have a switch that allows them all to be toggled on or off, So you can install ‘Deathstalkers Evil Inflation Mod!!! !11111’ and then when you realize it makes the game unplayable, just leap over to the mod-control panel on the main menu and toggle his awesome efforts off. I’d really like to see people getting into the idea of Democracy 3 modding. I’ve never thought I was the worlds greatest simulation balancer, researcher or tweaker. I’m, more the sort of designer that has big ideas and likes huge sprawling systems, but there are definitely people who will be better than me at tweaking the state of the missions, or the finer interactions of policies. Plus, there are people who want the game to be much more complex, or more free-market based, or simulate eastern or developing-world countries, and now then can do whatever they want. I’ve built a system and an engine, it’s up to the community what they want to do with it. I hope people have fun. if you check out the barefoot college website they say you can donate $100 to educate one child in a night school for a year. So let’s say we are providing 5 years of basic education per child, that means fans of positech games have paid for the education of 30 children. That’s pretty awesome, certainly the most money I’ve been involved in raising for charity. In some ways I think it’s possibly the most worthwhile thing I’ve ever done. I’m so glad we got that charity added, and I’d love to see other developers of the humble sales use it. Sadly there isn’t a breakdown on the red cross website for what each amount would achieve, but it’s obviously another decent cause. Checkbox seelcted graphic is now a tick, which should be mroe intuitive. Lightened some minister skin tones. Fixed transparency on one ministerial hairstyle. Grey lines are now used to show effects that are currently neutral (set to zero). Improved the smoothness of drawing connecting lines on main GUI. Fixed crash when selecting 'summary' tab on an empty voter group. Fixed bug where it was possible to fire ministers and there be insufficient replacements. Fixed crash bug relating to shaders and alt-tabbing when running the game fullscreen. GM food approval now pleases, not angers capitalists!(ooops). Detention without trial policy now harms foreign relations. Monorail policy now only affects CO2 through car reduction, and reduces car usage more. WelfareFraud Dept policy incomke is now scaled by the level of housing/disability/child/unemployed benefits. Increased the strength of the BorderControls policy for the USA mission. Reduced impact of BorderControls policy on Immigration. 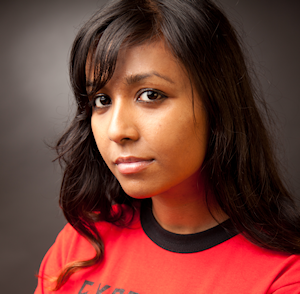 Added new effect from Foreign Relations to Immigration. Negative health effects from drugs is not a curve, skewed to harder drugs. Oil price Shock event now affects the oil supply, not demand. Maximum cost of the RoadBuilding policy increased by 20%. 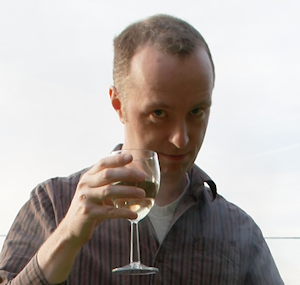 Increased delay on effect of inheritance tax on euqality to 24 turns. Fixed wrong equation(backwards!) for the effects of unemployment on immigration. High unemployment now reduces immigration. Added new simulation value: Legal Drug Consumption. Added new policy: Recreational Drugs Tax. I ran an ad on reddit recently on the /games subreddit. 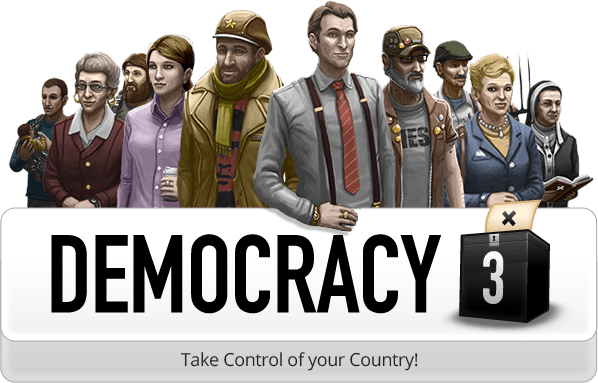 it’s the place for fairly serious gaming debate, and I thought it would thus be a good match for my very serious political strategy game Democracy 3. It was a ‘sponsored link’ right at the top of the page. First things first, don’t let all that information on reddits ad page about ‘how ads work’ fool you. That’s an old comic they drew years ago and is completely wrong. they just sell impressions at $0.75 CPM. they really should update that…(I think this is a recent change). Anyway….normally $0.75 CPM is a bit high for indie game advertising, but it was targeted, and a good experiment in a potentially rich new source of players. I put $250 into it, which lasted about 3 days. Only 199 views? that’s insane where are all the other views? Let me check my webalizer server logs instead… I see about 2,200 hits from reddit/r/Games for the month (which is almost certainly all this ad, as I have been listed only in /indiegaming until this. If I look at different logs from awstats I get 1,000 visits for the month from /r/Games. So what value do I believe? Would I advertise on reddit again? Maybe, but I have other methods I’m experimenting with for now. (BTW don’t bother with google video ads, total waste of time and money). 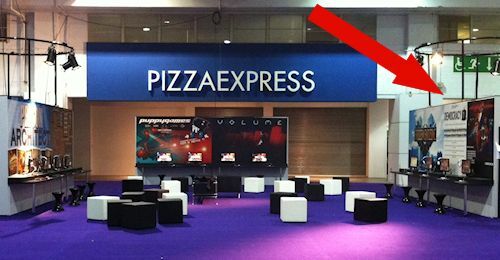 Eurogamer Expo, press & public come see our games! PLEASE COME CHECK OUT OUR GAMES. We will be in a big indie booth collection near prison architect and hopefully lots of nice places where you can actually sit down. We will even have FREE BADGES. How can you turn that down? Press people be aware that these are two new games currently in beta and both heading for release soon on Steam/GoG, so get in early and write up your impressions NOW!